As a response to my earlier tracking of the #CharlieHedbo memes and artwork on Instagram (see here), I conducted a similar manual archive on the #JeSuisAhmed hashtag on Instagram over six hours (9 January 15, 0600-1200hrs, GMT+8). I had initially chosen to trace #CharlieHedbo as opposed to #JeSuisCharlie as I had anticipated the former to provide a more neutral stream of sentiments on the event. 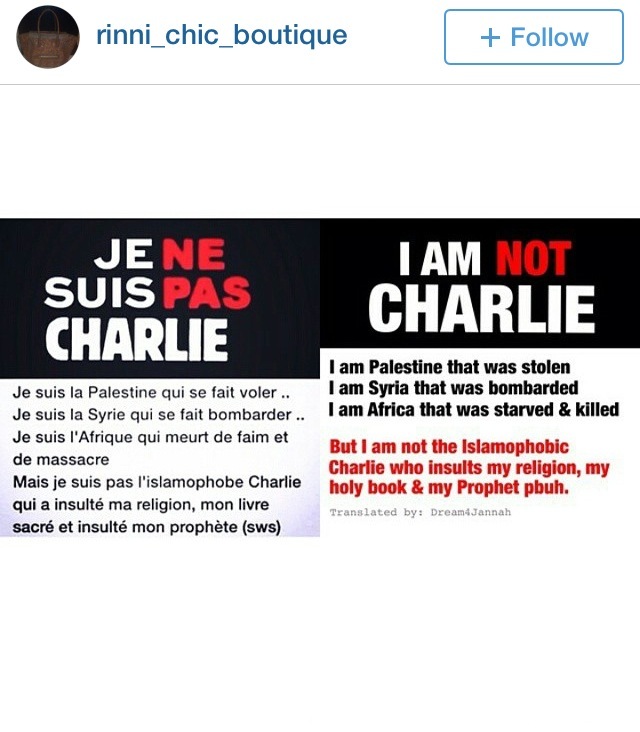 While there seemed to be no overt Islamophobic sentiment during the time period in which I took screenshots on Instagram, an overwhelming proportion of the posts resonated with the now viral ‘I am Charlie’ slogan. This largely backed “free speech” and defended the rights of Charlie Hedbo magazine to publish their contentious cartoons. However, an undercurrent of solidarity soon emerged on the #JeSuisAhmed tag on Twitter and later on Instagram, as a mark of solidarity with policeman Ahmed Merabet, a Muslim Frenchmen, who was one of the two officers shot and killed in the Paris shootings (see here and here). While many of the Instagram posts on #CharlieHedbo and #JeSuisCharlie were cross-posted on #JeSuisAhmed, a smaller number of posts popular on #JeSuisAhmed offered a more balanced, more vocal, and at times more subversive reading of the incident. Many of these called for the separation of terrorism and religiosity, critiqued bigotry disguised as free speech, and addressed rising fears towards Islamophobia and prejudicial repercussions from the profiled suspects (see also this piece on Junkee based on this Reddit thread). This post archives some of the collective imagery formed around #JeSuisAhmed that was birthed as a response to #JeSuisCharlie. 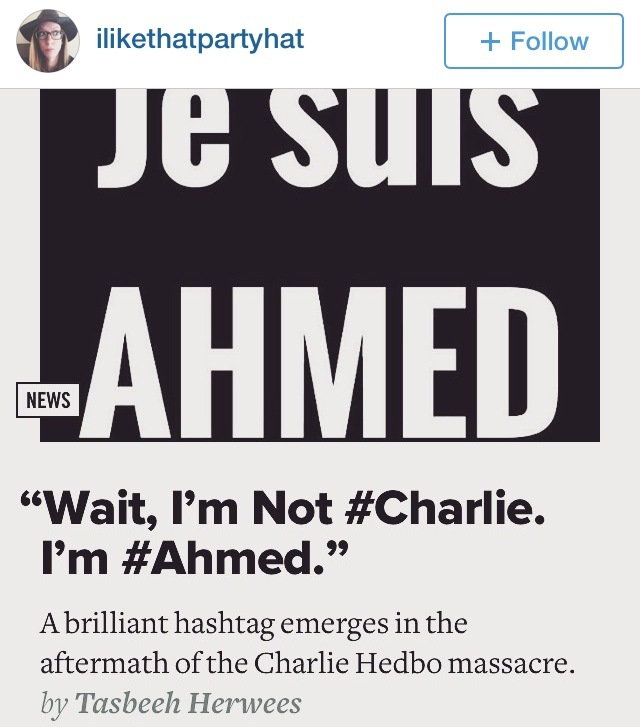 Have any other popular #JeSuisAhmed memes and tropes stood out to you? Let’s chat! Beep me!